Following on from many years of having received the Gold Payroll Giving Award, we are exceptionally pleased to announce Golledge have been awarded the Diamond Quality Mark in this year's Payroll Giving Awards! 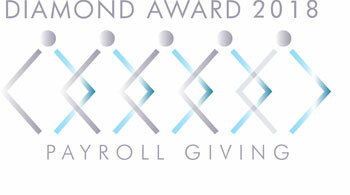 The diamond mark is brand new for 2018 and is the highest possible level of achievement awarded by the Charities Aid Foundation (CAF) in recognition of companies which provide great payroll giving services. In order to achieve the diamond award Golledge have achieved over 30% of our employees contributing to charity through their payroll, in addition to matching donations. We're exceptionally proud of this achievement, even more so as we're one of only 80 companies in the UK to achieve this level of payroll giving. You can find a list of all the companies which received the Diamond Award this year here. If you're interested in our achievement and the charities which have benefited from our contributions please speak to a member of our team by calling +44 1460 256 100 today, or if you're thinking of setting up Payroll Giving within your company you can find all the details you need on the APGO (Association of Payroll Giving Organisations) website here.